I struggled with acne for many years. Unfortunately, I didn’t just have a few pimples on my face, I was constantly covered with severe acne. It was so bad that I felt self-conscious all the time and even dreaded leaving the house. I tried literally every product I could find, every face wash and cleanser for acne, every acne cream (which cost me a small fortune), every natural acne treatment out there and eventually I even used prescription acne drugs. Through this journey, I’ve learned pretty much everything about acne and how to get acne free skin and this is exactly why I designed this website – to show you what works and what doesn’t so you can get rid of your acne once and for all. Before you can begin to understand how to treat acne, we first need to understand the basics and figure out what kind of acne you’re suffering from. Acne (also known as Acne Vulgaris in medical terms) is a pest in many people’s lives. While it’s not dangerous in itself, it’s unsightly, and affects millions of people’s lives – especially in terms of self-esteem. 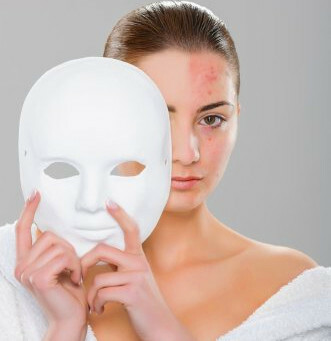 In some cases, acne can cause long-term scarring. Acne occurs when oil accumulates under the skin, as a result of blocked pores. Dermatologists estimate that acne affects around three-quarters of teenagers, but in reality it can affect people of all ages. Due to testosterone, young men can be most affected at puberty. Blackheads – visible and appear on the surface of the skin and as their name suggests are black. Acne and pimples are frequently used interchangeably and the truth is that the difference between acne and pimples is minor. Acne is a more severe and chronic condition, while pimples are usually associated with a mild outbreak. But both are caused by blocked pores and the solutions tend to be similar. The good news is that there is an end to the misery and this website is completely dedicated to finding the best acne treatment for you so that you can get rid of your acne once and for all. There are a thousand and one acne treatments, and it can be confusing to understand which one will work for you, something this website will help you figure out. Pore cleansers, which usually can be bought over the counter, and prevent the pore blockage that causes spots. This is by far the most popular option. The second spot treatment involves products that focus on either the production of the hormones or oil that leads to the pore blockage. This is a much more drastic measure and usually reserved for more severe acne. Throughout this website, we’ll look at the best acne treatment and the latest pimple remedies to ensure you know how to stop acne as fast as humanly possible. This website covers the best natural remedies for acne which have been tried and tested; and reviews the top OTC treatments, including face wash, cleansers and creams. Finally we’ll even dig into the world of professional treatments and acne medication in the event all else fails. One thing to remember is that a solution for one person might not be the best option for you due to a different skin type. So it’s important to try different solutions and not get to discouraged if a top acne treatment doesn’t seem to have much of an effect on you. For that reason I will be creating as many acne treatment reviews as possible, so you can find the best acne cure for yourself. Finding the best face wash for acne is tricky – there’s so many different face washes out there, no one really knows which one to pick anymore. That’s why I’ve thoroughly researched the different acne face washes out there and summarized the results so you can find the best acne face wash for your skin and start seeing the best results straight away. I remember hopefully trying out a different acne wash each week, only to find that the advertisement was completely false and the face wash couldn’t even clear a pimple if it’s life depended on it. By following my recommendations, you’ll find the best acne face wash for your skin without all the trial and error. Sometimes the best solution to get rid of spots is to use a natural acne treatment. There are too many home remedies for pimples to list here, so I’ve devoted an entire page to helping you find the best home remedies for acne. A natural acne treatment is by far the easiest, safest and cheapest option if you’re looking for immediate results. Whether it’s applying some aloe vera, toothpaste or manuka honey – we explain exactly what acne home remedies work and which ones don’t to save you the time and effort of going through them all yourself. There’s also an entire page devoted to reviewing all the best natural oils to combat outbreaks. There’s also promising evidence to suggest that taking vitamins and supplements for acne can have some great results as well. When natural and over the counter products don’t help, it might be necessary to seek medical help, in which case you might be prescribed antibiotics for acne or a prescription acne cream by your doctor or dermatologist. Medication tends to be a lot more powerful and is more likely to resolve the issues, but bear in mind that medication can have many more unpleasant side effects. I’ll be looking at the best acne medication in more detail, as for some people; this is the only route that will create lasting results. But medication is not the only option. There are plenty of procedures a dermatologist or esthetician can use to improve your skin condition – something I’ll be covering in much more detail to ensure you make the right choice. Everyone wants to get rid of their spots as fast as possible. Whatever the reason, no one wants a face or body full of pimples. Some people are able to get rid of acne fast, while others, such as myself, have to endure a longer struggle. I was able to rid myself of acne eventually, but it took a while – which is my motivation to create this website. I really hope to help as many people as possible to find the best treatment for acne for their skin type. By reading the articles on this website, you’ll be able to avoid the mistakes I made, and learn the lessons I learned over the years of struggling with severe acne. There is such a thing as an overnight pimple treatment – but it doesn’t work for everyone. But rest assured, if it works, you’ll find it here! I highly recommend reading the home remedies for acne page to get started immediately with trying out the most effective natural remedies for acne which have already worked for thousands of other people just like you.